Q: How do we donate wreaths? A: Click on any wreath icon to go to the secure donation page. Choose the community where you would like your wreaths to be placed. List your name to be added to the 2019 Donors. Q: Describe these wreaths and where will they will be placed? A: These are live Balsam fir wreaths . 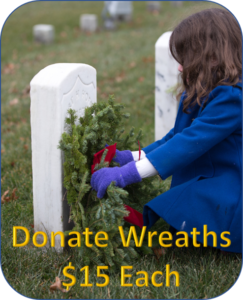 They are handmade and shipped from Wreaths Across America, Inc. a Maine nonprofit. Your wreaths are destined for Colorado cemeteries in Colorado Springs, Denver, (Fort Logan), Grand Junction, Greeley and Fort Collins. You designate the city where you wish your wreaths to be placed. Q: Is my donation/sponsorship tax deductible? A: Yes, it is. Senior Veterans, Inc. is a 501 (c) 3 public charity based in Colorado Springs, CO. We received our IRS Exemption on November 15, 2011. You can view all of our legal documents, including our IRS Determination Letter, on the “About Us” page on this site. You will receive an immediate receipt for all electronic donations. Q: Can I send a wreath donation by mail? A: Yes, you can. Our mailing address is: Senior Veterans, Inc., P.O. Box 61030, Colorado Springs, CO 80960. Please write “Wreath Campaign” in the memo. We will send you a receipt. Q: Besides wreath donations, how else can we help? A: Share the powerful video on your Social Media. Give what you can and ask your family, friends and colleagues to do the same. Every wreath is donated by grateful Americans just like you. Our charity does not receive federal, state or local funding of any type. Q: How do the three parties, Wreaths Across America , Senior Veterans, Inc. and Colorado’s cemeteries work together? A: Senior Veterans, Inc. is a lead fundraiser for Colorado. Wreaths Across America provides the wreaths and arranges transportation to the cemeteries. Colorado cemeteries are destinations. The three parties do not represent, endorse or speak on behalf of the others.